Men deserve cruelty-free shoes, too! There’s been a growing demand for men’s vegan shoes in the last 10-15 years or so and, happily, also a growing number of places where you can get them. Whatever shoes you’re looking for, you can now get a cruelty-free version. Here are some companies that will help. Because you can’t always afford to buy a pair of £100-£200 vegan shoes but still need to go to that job interview / wedding / hot date. These are far cheaper and probably won’t last nearly as much as the more expensive vegan shoes, but are often very attractive and perfectly fine for occasional wear and when funds are tight. Also great for completing a great current look without buying leather. Big brands are often quicker to buy into trends than the vegan designer brands. The following are brands that mark vegan footwear clearly. I will be adding more as I find them. H&M – Lots of clearly marked, non-leather shoes and boots in both timeless and trendy styles. Great for smart casual, casual and even smart shoes. Also: they are cheap and they exist pretty much everywhere. Supposedly don’t use animal glue. Burtons – a British men’s fashion brand offering some clearly marked non-leather shoes and boots. Quite a few timeless smart casual styles, plus occasional smart shoes. Toms – Famous casual shoe brand with a very familiar style of slip-on shoe. Also make trainers and casual brogues. Their vegan styles are very clearly marked and the company is also ethical (though not 100% vegan). OK, so I know a lot of guys really hate buying shoes, so what you really want is a really good pair of shoes and boots that will last you for years and years. Luckily, there are some companies that will do this for you in vegan materials as well. Vegetarian Shoes – UK-based ethical vegan shoe company providing everything from smart work shoes to rugged boots, safety footwear, leather-look trainers, brogues, sandals and pretty much anything else you could ever want. Their shoes will last you for years. I own a pair of their combat boots that’s still going strong after 8 years. The Chelsea boots and paraboots in the photo above are theirs. Ethical Wares – Another one-stop shop offering a range of styles. I personally don’t like all of their styles, but they do offer a good range of solid footwear, including useful stuff like safety footwear, smart work shoes and even professional dance shoes, so are very useful. Green Shoes – Made to order “countryside bohemian” artisan shoes and boots that will last you a lifetime. If you can afford the upfront price, this is a very good investment. All shoes can be resoled and are made of tough vegan materials in the British countryside. Some very beautiful boots and shoes. The company also makes leather footwear. Free Rangers – An Etsy store for this UK vegan company making sensible footwear and non-leather accessories (belts, wallets, bags, etc.). Quite traditional styles like desert boots and stuff like that, but well made and hard-wearing. Dr. Martens – Have a growing vegan range of boots and shoes that includes several options for men. New Rock – Make very rugged goth / cyber / club / biker boots. Been famous since the 90s. They make boots to order and many styles are available in vegan materials. Pennangalan – UK company making alternative shoes and boots to order. High quality stuff, if goth / steampunk / cyber is your style. Sandali – An Etsy store for this traditional sandal manufacturer. Has a big vegan section full of traditional unisex styles. Eco Vegan Shoes – A Dutch vegan shoe company that’s great for stuff like hiking / safety footwear, trainers, lace-ups and other everyday styles. Inov-8 – A British company making 100% vegan shoes suitable for road running, a variety of trail running conditions and even park / hybrid shoes. Also sell other sports fashion. They are based in the Lake District so probably know a thing or two about hills. Topo Athletic – 100% vegan makers of road running, trail running and gym shoes. On Running – A Swiss company that makes technologically advanced running, HIIT and gym shoes that are 100% vegan. Newton Running – An American company making 100% vegan running shoes (road, trail, beginner, etc.). Vivobarefoot – Minimalist sports shoes including running shoes. many styles are vegan and are clearly marked as such. This is their UK site and this is their US site. Asics – A popular brand with plenty of vegan styles to choose from. This is their UK site and this is their UK clearance site where you can usually find some good deals. US site is here. Superga – Distinctive plimsole style trainers / sneakers. Many vegan styles. Macbeth – a skate shoe / trainer company fronted by Tom DeLonge (from the band Blink-182) and some of his other rocker friends. Use no animal glues in their vegan styles, and there are plenty of those. These are brands that make 100% vegan, attractive shoes for guys. I’ve not tried them myself yet, which is why I’ve not listed them in the “buy and forget” section. This doesn’t mean these shoes won’t last and last. I just have no personal experience. Friendship Shoes – Stylish modern takes on timeless classics like brogues, Chelsea boots, etc. All shoes are unisex, and hot. Good Guys Don’t Wear Leather – 100% vegan designer shoes from France. French chic meets Americana influence. Trainers, boots, shoes and sandals. Very cool. The smart buckle shoes in the pic are theirs. Nicora Shoes – Beautiful smart / casual shoes from this 100% vegan, ethical and eco-friendly store. Keep – Ethical clothing and shoe company from the US that makes very cute smart-casual trainers and boat shoes. 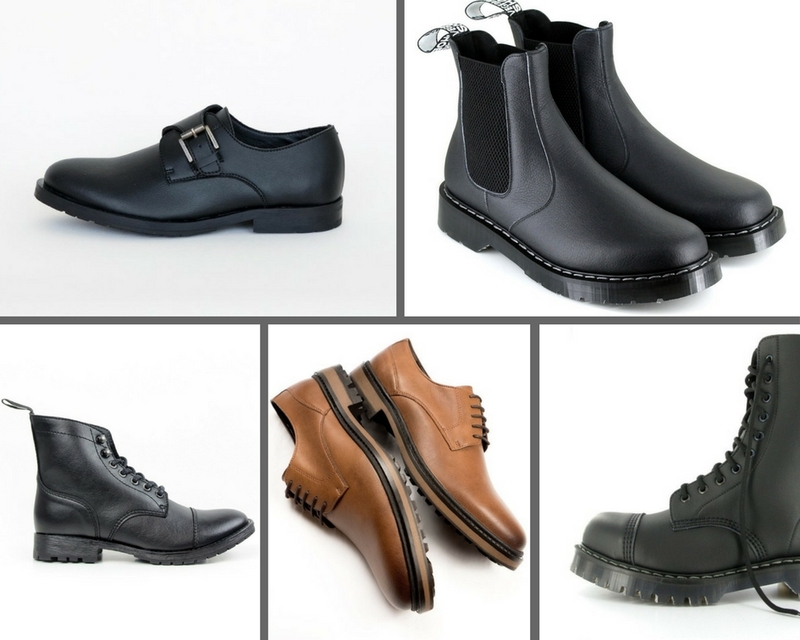 Wills Vegan Shoes – A great place to pick up smart, attractive work shoes for a reasonable price, as well as casual / smart casual boots, trainers and other non-leather accessories. Prices range from under £100 to over £200, so you have a choice. The brown derby shoes and black boots in the pic above are theirs. Ahimsa – Smart trainers, sandals, Derby shoes, boots, etc. Also sell bags and accessories. 100% vegan, ethical company. Nae – Fashionable casual / smart casual shoes and boots with occasional smart work shoes. 100% vegan. Po-Zu – An ethical, sustainable brand offering cool vegan (and non-vegan) trainers and other funky casual shoes. T.U.K Shoes – A funky alternative brand that makes creepers, boots, etc. Many styles are vegan. “Cool Japanese Shoes” – An Etsy store selling awesome canvas trainers and boots that are actually apparently Japanese work boots. Some have steel toes, too! Very cool cyber style. VogasBarcelona – Fun espadrille boots. Everything 100% vegan (even the stuff that looks like it’s trimmed with leather).